Hello loyal and supportive readers! 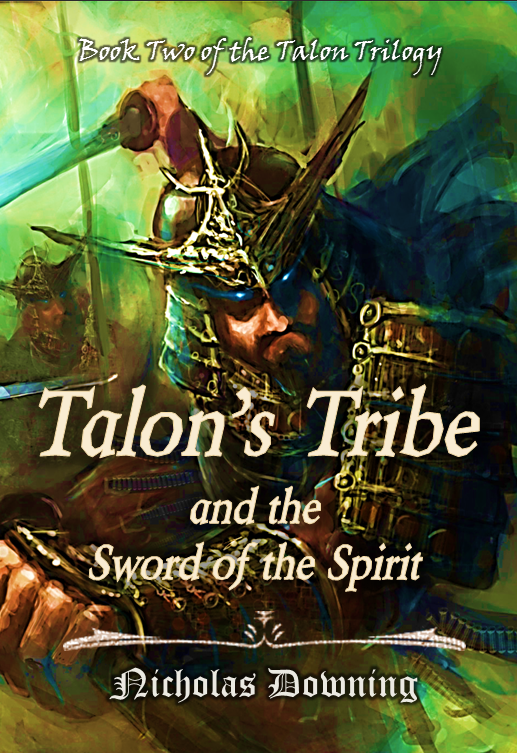 It is with great sadness that I must report Talon’s Tribe the Sword of the Spirit is behind schedule and will not be ready for release in time for Christmas 2015 as I had originally hoped. After much discussion and prayer, I have decided not to release this novel in two separate installments. For more information about the sequel and a more detailed explanation of the personal hardships that have prevented me from being able to get the book released on time, please read the following blog post. I can’t wait for the release of Book two in this trilogy!! From the Author: Thank you so much for the kinds words of encouragement! So glad you enjoyed the book. Please feel free to leave a review on Amazon if you don’t mind. I am currently working on Book Two but it has been a busy year and one saddled with hardship. One of our four kids has a disability we are working through so prayers much appreciated! I am thinking about releasing part one of the second book as early as this winter with the second half coming out a year later. As a fan, what do you think? Would you rather wait another year for the whole book to be released at once? Praying for your specially-made child, as well as your family, because I understand how challenging this can be for the whole family! My now-adult child (ADHD & a learning disability) contributed to a good number of the grey hairs I now wear hehehe There have been some very challenging times with lots of tears & prayers, but it’s incredible what God does with the things which look so overwhelming. I’ve learned that sometimes He works out the situation, and other times He strengthens us to bear up under the burden. In those times, that’s when my family really experienced the incredible blessing of brothers and sisters in Christ helping us to bear those burdens! Often, just knowing that people were praying for us was strengthening in and of itself, even if the situation didn’t change with my timing in mind. My heart goes out to your family, and while I can’t promise to pray every day with my terrible memory, I WILL write your family’s prayer need in my Bible to remind me…and I mean that. I know how encouraging it is just to know that people are praying. Thank you so much for your kind, encouraging words and offer of prayer. Some days are better than others but we know God has a plan for our beautiful daughter! It might not be exactly what we had in mind for her but we are learning to trust in his timing and to accept that even in this, He does all things for the good of those who love Him. I have thoroughly enjoyed Talon’s Test, and I have been anxiously awaiting the release of the sequel! I have read it several times, each reading builds the anticipation! It is pretty amazing how our plans often are not God’s plans, yet His ways truly are the best and ripe with blessings (even hard ones). I pray the LORD richly blesses you, granting peace and perseverance! Oh wow! Brenda, this is one of the sweetest and most uplifting compliments I’ve ever received from a reader. It means the world to me that you would read and enjoy my book even once. Hard to imagine that you would read it several times! And it makes me all the more sad to report that I am behind schedule due to family hardships. I will be posting a blog this week to explain in greater detail but I’m truly sorry for letting you and anyone else down. I hate to keep you all waiting for the sequel. Please be patient with me and if you would be so kind as to leave a customer review on Amazon that would be a huge help! And since you are such a voracious reader, please let me know if you’d like to be a beta reader when I have finished the draft manuscript. I can use all the help I can get! Howdy, Nick! I was just checking back in to see how progress on Talon’s Tribe was going and saw your reply. Sorry I was so late in responding!!! I would be delighted to be a beta reader, though I am sure that my reply is too late and that you are way past that stage of publication. 🙂 I truly am excited for the second installment of the series and am planning on rereading the Test again soon. Please let me know if there is anything I can do to help! May the grace and peace of Christ be multiplied to you! Blessings! Congratulations to Author N.P. Beckwith, recipient of the Reality Calling Christian Religious Fiction Award! Author News: Erin Burnett Launch Party and Martyr by NP Beckwith becomes #1 Amazon Kindle Bestseller! Interview with new Flagship Fiction author Erin Burnett!